[Performance] Spin and Control are excellent. The Innerforce Layer ZLC offers a completely new experience by combining ZLC Carbon technology and Innerfiber construction. Carbon layers are placed closer to the core to provide an overall soft feel without losing the ZL Carbon characteristics such as lightness, flexibility and speed. I just hit with the help of junior, but you can all play is stable. I felt Na completely different and in particular front-end processing and block bench technology is easily Amurutato such. If you say the conclusion is pretty close to the wood! Inner Force alc feel slightly hard but more of zlc reblogged or material to soft bow feel. However, I did not go out jump of zlc If you do not a lot of bang. This racket is enough to to do!? And doubted that contains carbon. And the surprise of the butterfly's that Na was able to achieve well so far in advance put zlc a sense of wood, it well should have bought this normally the five plywood? It came out the question of. Eventually there is a story that lives should have bought a little bouncing the five plywood only there is a surprise that "so rotation takes do it over to you doing put zlc, unreal!". I myself is impossible to put out 20,000 yen a little bouncing racket than that the five plywood. Although the inner Force alc still feel there is that Naa's alc, zlc does not have a personality because it does not almost the same with the wood. Their likes there more of Amurutato there is likeness zlc. Since the personal impressions can not say anyhow, I want you to a little bounce. It was a good impression that the benchtop backdrive was easy to strike. It was easy to stop and so on, so I got sticky toppings, so it was easier to handle the benchtop as a whole. In the rally etc after it fell down, there was a feeling of lack of speed compared to the outer system compared with the outer system, although the ball became linear, It was a bit painful. For that reason, I felt it was a very matched racket for the battle pattern with backhand as the main body in the former team. I think that rubber tension type rubber will fit. I think it is easy to attack with stability when the back is a little soft tension system. It was a transition from Corbell. The center of gravity was slightly lighter than the racket, the weight was somewhat light, the grip was slightly thick. The amount of rotation is about the same as Korbel. Speed was about a little faster than Kolbel. The momentum does not change to that so far. However, it is the size of the sweet spot which is outstandingly superior to just one. So, if you combine rotary type rubber, it may over. 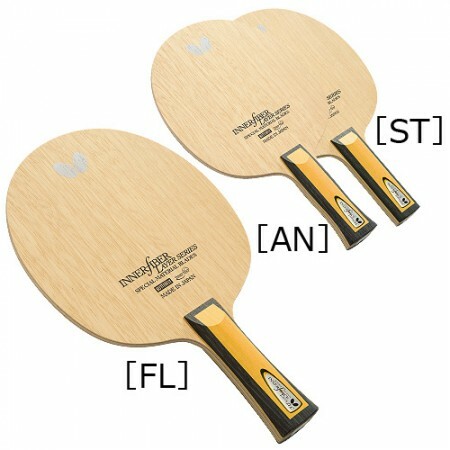 As a conclusion, even a beginner can use it, but I think that I can not master it unless I am an advanced expert who can adjust the angle of the racket with my wrist. I moved from the outer carbon of Gorigori to here. I will review the rough technology. Compare with the feeling of outer carbon and 5 plywood based on. · It does not fly without permission with hit feeling close to 5 plywood. · There is kindness that even beginners can handle. · It is not stable. If there is unevenness in impact even a little, it is conspicuous compared to other racquets as it takes over or over the net, and a bad part of the inner system comes out. · It is very easy to do so if you do not play it like a play, it will take a firm turn if you try to spin it. · There is unevenness in jumping when trying to speed up. · There is no thing to fly, and it fits in the table. · Cut from the backwards also falls smoothly with low trajectory. · Especially the block which captures the sideways of Tsutski and the ball is fairly easy to do. It is a place I'd like to say to recommend special materials for the first time, but I will only fly to some extent because I do not fly or fly if I am not a person who can adjust the impact firmly. I have tried a lot of racquets up to now, but I personally think that it is the best racket! Compared to layer alc, layer zlc does not play better when hitting, I feel like holding a ball. However, when banging, it plays well. There is a sense of overall stability and balls enter into the platform as much as interesting! I am the best racquet I recommend, please try using it!